By the time that a Magician is able to cast this spell (level 61), completing this quest is quite straightforward. A mage can solo general POI mobs with a 61 pet. Both the quest items appear to be uncommon, you should get a gem within a score or so kills, you'll typically see several gems drop on a raid. Oxidised Steel Plate can be bought in bazaar for low plat, though it drops at the same rate and is not lore. That said, I can sell these spells in bazaar for a few hundred quite quickly, making them a nice little earner. How much does this spell go for? I found both drops from PoI (Yay!) but I'm only lvl 59 (Boo!). Looks like I've got to keep these two things in my inventory for two levels. Just ask a magician to summon a sapphire bracer for you and complete the quest. You won't be able to scribe it yet, but at least it only takes up 1 bank slot. #Pomaikai, Posted: Aug 12 2003 at 5:07 PM, Rating: Sub-Default, (Expand Post) I looted this item in PoI. Alla's says it is used in a quest, but does not state which one. The graphic for this item is the one used for a diamond. Just a thought. It might be this item. Dunno, just a thought. Here's the link. Anyone got any info on where to get the cohesion gem? I had a gem drop off random trash at the Innovation entrance area last night...several in fact. They are LORE, NO DROP and have a Star Ruby graphic. Will send in a screenshot as soon as I take one. Just confirming, I had 20 min to kill before work in the morning today. I decided to go solo for that time in PoI. I pulled to the GY from LEFT (around and just past the factory entrance), and the cohesion gem dropped of one of those mobs. guess someone complained that they had to hunt parchments to get the lvl 61 bracer... Sapphire BTW...not steel, unless this is a new one. Hunting parchments? Nonsense, you can buy almost all of the 61-62 mages spells for under 1000pp in the bazaar on my server. 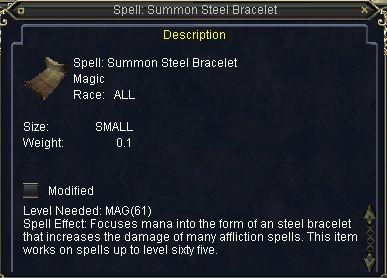 Look at the name of the bracelet this spell summons, Rallican's Steel Bracelet. That is not the same as Gallenite's Sapphire Bracelet. The effect is a DOT damage enhancer on this new one, not a DD enhancer. Personally I think this spell is long overdue and I am glad I can now conjure things that help the non-DD classes.